Reach Dongzhimen Transit Hub by metro line 2 or 13. Get on bus 980 Express Line there to Miyun Gulou and then walk backwards for a few yards to take bus no. 61. Alight at Beishipian and you will see a basketball court in front of you. Follow a path next to the court towards the mountain. Go along the bottom of the valley for some time and you will see a well-preserved square foundation on a hillside at the mouth of the valley. That's the Goukou Tower. Climb up to the foundation and you will see the Baimaguan Perfect Tower standing at a higher hilltop to the north. After reaching the Perfect Tower, please head westwards to get down from the mountain. You will reach at Baimaguan Village in around 50 minutes, which was the former Baimaguan Fort with southern gate and some ramparts still remained there. After that, please take bus no. 61 at Baimaguan Stop to Fanzipai Village. There is an exhibition hall of unique multi-lingual stone inscriptions. After visiting there, you can also make a stop by to the nearby Gushan Temple. Today's independent Baimaguan Great Wall tour will end at this point. You may take bus no. 61 from Fanzipai Township to Miyun Dajuyuan Stop, and then transfer to bus no. 980 back to downtown Beijing. 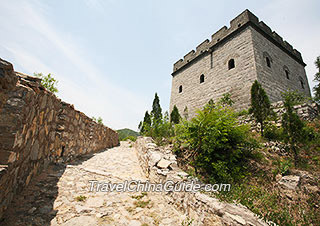 Baimaguan Perfect Tower: The tower was built during the Ming Dynasty (1368 – 1644) on the top of a mountain. Different from other simple watchtowers, this one consists of two storeys with the upper one looking like an ordinary residence in small version. You can see four vivid beasts' statues at each upward cornice. Stairs at the foot of arches are decorated with blooming lotus, which represents 'peace' because of the similar pronunciation in Chinese. Baimaguan Village: The village was developed from the former Baimaguan Fort and the southern gate of the fort is still well-preserved. 'Baima' in Chinese means 'white horse'. 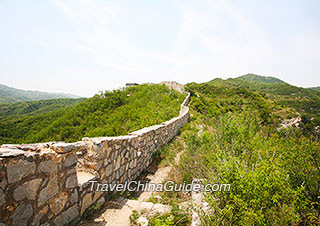 According to a legend, the fort was so named because there used to be a fierce white horse and was then tamed by a renowned general named Yang Yanzhao to defense this ancient fortress. Wandering around the village, you can still find some old stone-laid houses, ancient wells, and grinding stones looking as they did originally. Multi-Lingual Stone Inscriptions: 20 or so inscriptions were carved on the hillside rocks during the Yuan Dynasty (1271 - 1368). The contents are the six magic words of the Tibetan Buddhism in Sanskrit, Mongolian, and Tibetan versions. The largest characters are of a height of 1m and a width of 30cm for each. 1. It is not suggested you to set out this backpacking tour to Baimaguan alone. Find some companions or even a local guide to help you complete this hiking tour. 2. Wearing short-sleeve t-shirts, shorts, or skirt is highly not recommended either as you might get scratched by branches or grass leaves.